I am home. Laundry is in, I’m fairly well caught-up on sleep, and the return to my own time zone hasn’t quite killed me, so I think it’s safe to say I’m good. 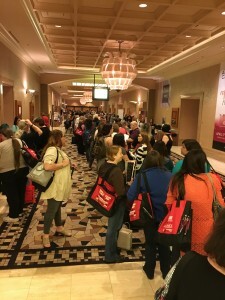 I have spent the past five days at the Romantic Times Booklovers Convention, which was in Las Vegas this year (side note: I was reminded how not used to it I am to be in a public place where smoking is still allowed…that was decidedly unpleasant, though the wine bar made up for it…). I went last year for the first time and decided it’s worth the time, money, and effort to attend these things. Not only because I learn a ton of new tricks and tips regarding my craft. Not only because there are authors in attendance of whom I am a big fan. But because it’s important that I, as a lesbian romance author, make myself visible. Lately, I’ve seen some responses from the lesfic community to e-mails and comments to Facebook statuses that shrug off “mainstream” organizations like RT or RWA (Romance Writers of America — another conference I will attend this year), with a scoff and a “well they don’t include us, so I feel no desire to join them.” Here’s the thing, though: we say we want inclusion and they are working hard to include us. Hard. It’s new, yes. But both RT and RWA have made very vocal statements about increasing their diversity. It’s not just LGBTQ writers that want in. It’s African-American writers and Asian-American writers and writers who write about protagonists that don’t fit the romantic stereotypes and so many more. It’s all of us. We all want inclusion and we must acknowledge when it’s being offered. I figure the only way to become visible is to BE VISIBLE. So I go to these gatherings and I mingle. 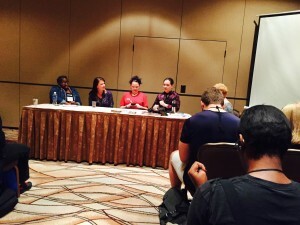 I sat on a panel this year with two bisexual authors and an asexual author, all of whom are looking to be seen by readers. It was amazing and an honor and I was so glad to be–here’s that word again–included. And we had a good-sized audience (shout out to Melissa Brayden, conference buddy extraordinaire, for the photo). These organizations may be taking baby steps, but they’re still steps, you know? Okay, off my soapbox. Let’s move on to the conference itself. First off: it was huge! I heard somebody say there were 3,100 attendees. That’s a LOT of romance fans. I wish I’d taken a picture of the Book Fair/Author Signing because that was madness. Of the dozen or so panels and workshops I attended, only two had less than fifty people in the audience. There was so much to choose from; literally ten or more options at any given time, so choosing was a challenge. I did well for the most part. If I could go back and do it over again, there were only two or three panels I’d have skipped for something else. The standouts for me were “Churn it Out: Write Fast & Frequently” (I attended this one last year with the same panelists and they came back this year with even more tips and advice); “Plotter or Pantser: There’s More Than One Way to Write” with well-known authors Susan Elizabeth Phillips and Susan Mallery; “Romantic Comedy”; and all of the LGBTQ panels I attended (yes, there is a diversity track, people…see?). As usual with this kind of a gathering, I took copious notes and have a bunch of new methods to try in my own writing. Some are about actual writing. Some are about organization and time management. Some are about marketing and social media. But all of it will help me better my craft and my career and isn’t that what we all want? That is why I attend. Dear Georgia–Although I’m not a romance novelist, I applaud the fact that you participated in a “mainstream” event and wrote a thoughtful blog about how the LGBT writers should actively integrate themselves into the broader market. The more we expand our readership, the more value we add to society’s understanding of the gay experience–ditto for African-Americans, Asians, Latinos, and people from all kinds of different cultures and places. Reading the NYT book review, I’ve noticed an increased interest in diversity on its pages. Time to remove the barriers! Hi, G! I’m a member of RWA, but I can’t make the conference this year. It’s too close to GCLS and kinda pricey. So take good notes! I absolutely agree with your assessment. RWA, especially, is working hard for inclusion. Yes, they’ve screwed up in the past, but things don’t change if you don’t jump in and help, is my attitude, so I became a member last year. Glad I did, too. Thanks for the tip on RT, too!